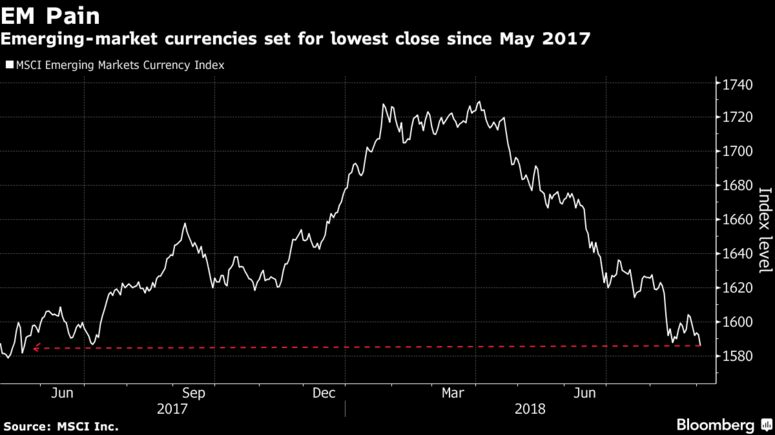 Emerging markets sold off anew Tuesday as South Africa entered a recession and Indonesia’s rupiah joined currencies from Turkey to Argentina in tumbling toward record lows, reinforcing concern that contagion risks are too big to ignore. MSCI Inc.’s index of currencies dropped for a fifth time in six days, set for the lowest close in more than a year. The rand led global declines as data showed the economy fell into a recession last quarter. Turkey’s lira slid on worry the central bank will disappoint investors at its rate meeting next week, while the Argentine peso slumped to a record and Indonesian rupiah sank to the lowest in two decades even after the central bank intensified its fight to protect it. The dollar extended its advance to a fourth day as Donald Trump threatened to ramp up a trade dispute with China with an announcement of tariffs on as much as $200 billion in additional Chinese products as soon as Thursday. As U.S. rates rise, investor fears over idiosyncratic risks in emerging markets have climbed, including Argentina’s fiscal woes, Turkey’s twin deficits, Brazil’s contentious elections and South Africa’s land-reform bill. Meantime, the dollar is winning by default, according to Kit Juckes, a global strategist at Societe Generale SA. The rand plunged as much as 3.4 percent after a report showed South Africa’s economy unexpectedly entered into a recession for the first time since 2009. GDP shrank an annualized 0.7 percent last quarter from the prior three months. The lira sank as much as 1.3 percent and Mexico’s peso weakened as much as 1.6 percent. Argentina’s peso slid to a fresh record low. Indonesia’s rupiah fell for a sixth day, sinking to a fresh two-decade low. CBOE’s emerging-market volatility gauge rose to the highest in almost three weeks. MSCI’s index of EM stocks dropped for a fifth day; MSCI’s currency measure slipped 0.6 percent, the most in almost a month. Russia’s ruble pared losses after the central bank edged closer to raising interest rates for the first time since 2014. Emerging market chaos is now front page news. This entry was posted in Bonds, Stock Market and tagged Currency Market, Emerging Market, USD on September 4, 2018 by Bone Fish.